Mr. Magatte Diop is a banker and an entrepreneur with more than 35 years of experience in international finance and management. He is the Chairman of Peacock Investments, a housing and real estate development company in Dakar, building thousands of housing units in Senegal and West Africa. He is the founder of ILICO-SAGEF Group, composed of a life insurance company and a real estate development company, where he served as the Chairman of the group until 2010. Previously, Mr. Diop was the Managing Director of M. R. Beal, an international financial firm which he founded after leaving CitiCorp. 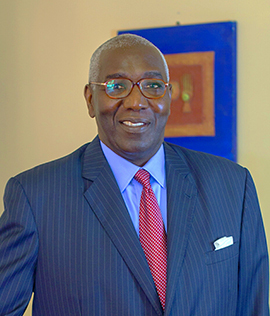 Between 1990 and 1993, Mr. Diop was the Vice President and Regional Director of Citibank/CitiCorp for West and Central Africa. Mr. Magatte Diop supervised the bank’s relationships with more than 200 financial institutions including central banks, development banks, commercial banks and government agencies in the African region. He recently founded a think tank called CERSSEM (Center for Strategic Studies for the Emergence of Senegal) to participate in the formulation of new economic policies for the development of Senegal and is decorated with the Medal of Merit by the Republic of Senegal. Mr. Diop is the President of the African Chamber of Commerce in New York and is very active in initiatives promoting commerce and investments between the United States and Africa. He is a board member of IntraHealth North Carolina, where he serves as President of the audit and finance committee. Mr. Diop has also served as an Advisory Board member of Dalberg Development Advisors. He has a Masters of Business Administration (MBA) from Stern Business School at New-York University.